This article is very much in the 'physics explains behavior' camp that Adrian Bejan espouses. Briefly, Adrian believes he discovered a new law of science in reaction to a mistake that Prigogine made in a conference in Paris. So, oversimplified, a pack of wolves is vitally concerned with the flow of energy from large animals into their own guts. And it turns out that human ideas of dominance (based in psychology) are not adequate explanations for the behavior of the individual wolves and the wolf pack. Now humans in the last couple of hundred years, with plenty of free energy, have been able to diverge from the 'natural' modes of behavior which are required in order to survive. Some of the divergences have resulted in less violence and more brittle economies. Many (including George Mobus and probably Mr. Hill) now believe that as we begin to lose the free energy, the brittle economies will collapse and violence (or just plain famine) will collapse the population of humans. *Adrian Bejan, the trackers, and the dog people have done a pretty good job showing that thermodynamics explains a lot of behaviors better than psychologizing. Bejan extends his analysis to all things which can flow, including rivers and arterial networks and lava, etc. I won't try to outsmart so many smart people. I will just observe something that really hit me yesterday. I am very interested in soil fertility. What we call the 'soil food web', coupled with the action of fungi, is responsible for the incredible fertility of soil in the absence of humans with fossil fuels. But much of the fertility results when some critter dies. For example, individual fungi live about 7 days. During those 7 days they accumulate in their bodies a remarkable array of chemicals which are beneficial to both plants and animals. When the fungi dies, those chemicals are released either directly into the plant, or into the critter which eats them, or into the soil. Without death, the beneficial chemicals would be locked up forever and life on Earth would disappear. Trying to hammer those facts into human 'happy psychology' is not very rewarding. Many people end up concluding that the Earth was created by God just for the benefit of humans. If you believe that, I don't have much to say to you. Absofuckinglutely YES! TOTALLY agree with you here, dog-gone it! Your first sentence is a fundamental observation about the working of human reality. That observation is also a determining explanatory factor about the ideological character of the concept democracy: "A democracy works only if the electorate are 1) intelligent1, 2) knowledgeable2, and 3) informed3. None of these criteria are true... ". Democracy was the outcome of a historical process of reconciliation that started nearly 10 centuries ago between "the European 3 social estates": the aristocracy, the clergy and the new rich merchants who were the recent beneficiaries of the long distance commerce that initiated Early Modernity. That social context was a European particularism that shaped the social setting of Modernity. But fact is that such a social context was never reproduced anywhere else which explains the resistance of the rest of the world to the concept of democracy. The European particularism engendered not only democracy but more importantly, in the minds of the early long distance merchants, it engendered "the Reason at work within capital". Centuries later, under the impact of the unmistakable financial success of the early long distance merchants, the realm of "the Reason at work within capital" morphed into a truth and was expanded into philosophic rationalism and science and technology. --- the mass market or the expansion of capitalism and the truth to all = democracy. But the belief in the universalism of European Modern values and concepts was nothing else than the triumphing ideology of the early merchants who, time passing, had transformed into the big capital holders who control the working of Modernity. In sum the predicament faced by humanity in Late-Modernity is due to the fact that the whole world has been brainwashed and made to believe in the triumphing ideologies of the big capital holders: hyper successful capitalism, the truth, and democracy. Now that we are awakening to the nightmarish consequences of the ideologies of Modernity "eusapient individuals" (wisemen) have to come to terms with what is really important in term of a species: its survival and its reproduction ...through the vehicle of societies that bind masses of individuals. Power societies and more particularly Modernity forgot about this inescapable reality. Now that the consequences of this forgetfulness are finally striking our minds ...nature is on the verge of taking over the direction of the march of life on earth. I would like to simplify this entire debate about the predicament we find ourselves in.I call it the 'more'concept. Regardless of one's race, culture,social standing, financial position and political persuasion, the common denominator is everyone want's more. I have yet to meet an individual in life, who is satisfied with what he has. I'm guessing a truly eusapient individual would satisfied a lot easier. My sincere excuses by this lengthy post, but what I felt the need to say cannot be reduced too much. The bottom of the problem you are exposing, as I see things, is quite simple, but at the same time, very difficult to accept and impossible to correct. The system has to change. Here is my simplified and quite crude view regarding your post, but certainly, the reality is far more sophisticated. Many things are left unsaid and not fully explained. The big issue here is one, democracy is not the natural way for humans. Humans were not made for that system, as two of the requirements you expose (knowledgeable and informed voters), will never be met by the majority of humans. Along this text I give you my view of why those requirements will never be met. As you know, I am a designer, thus, I practice the Intelligent Design as a daily basis. From that practice comes the methodology I have developed to put sense into the mechanics that explain and rule the Universe. Which it is based on the way we, as intelligent systems, design systems. Using the same logic, combined with a reverse engineering process. Something we also practice as intelligent systems. Among my theories to explain and understand the Universe, and put some functional sense into it, there is a special one for the human society, which I developed after decades of studying myself, the behavior of humans as families and individuals belonging to a society, and our society as a whole. This theory, based on the Principles of Functionality and the Intelligent Design, explains why humans behave the way we see, and why our society shows today so many problems of leadership and this clear trend of “going nowhere”. The more I watch our daily reality, the more this theory becomes a good explanation. One main conclusion is that humans are not equal. There are three types of humans clearly identifiable. From any clever designer´s point of view (following the universal Principles of Functionality, and Intelligent Design, just as some humans do everyday), to design and create an intelligent system with the big physical limitations of humans, and considering the environment where it was supposed to live at the beginning of their existence as a new species, the possible system would require of two main types of humans, leaders and followers. Those two types of humans were the logical way to make possible its survival as intelligent species in a quite wild and not friendly environment. Leaders are divided in two categories, high level and low (or second) level. Thus making three the types of humans we have around. This division is not based on what they actually do, but on what they can do in a proper and better way. Neither of them is better than the others, they all are needed, and just as important. They just have a different role to play. They are part of the Irreducible Complexity of the human society, using the concept created by Michael Behe. Leaders and followers are genetically created, during the gestation period by a specifically developed random process, where it is known in advance that some combinations will occur in some certain range of percentage of the total events. And it will always be that way. These processes are the result of well studied statistics and probabilities, and used on purpose to limit the appearance of some specific capabilities. One of the many ways to use what I call the “limited randomness”. Leaders and followers are biologically made and born to be one of them. Not to become. They are just the way they are. And that status or characteristic will never change throughout the life of each human. It is not possible to escape from the role you are born to. These types of humans are the result of the biological processes where our body and brain are made inside of the maternal womb. Randomness and statistics play a strong role at the genetical level to produce very few of one type, a few more of the other, and many of the third type (followers). Note that this is not a matter of heritage, as for each individual, the dices are thrown again. In general, each human is one a of a kind. In all areas (the same for other living creatures). We can clearly see these types of humans in our current society if we look for them. Although High Level leaders are very difficult to find, as they are rare, very few and naturally keep an ultra-low profile. And certainly Democracy does not give these leaders and opportunity to play their role. Our democratic system is mainly a competition for power, where other factors than capacity play an important role, and candidates are not selected based on their effective capacities for the role. From the functionality point of view, these different types of humans provide the necessary structure to survive as a group, as each type has a specific role. But as human society has become the most powerful system on earth, currently there are no external dangers to fear, other than ourselves. So, this High level Leaders are not really required today. Then, they do not show up. No need to. Today they just live like followers, something they can easily do, in a reluctant way certainly. Given the current status of things, there is no place for these leaders today. Although, as we have become a threat to ourselves, in a not so distant future, there could be a real need for these leaders again, as it was in the past. It is to be noted that these structure of leaders and followers was thought and created to operate at the beginnings of human society, some 40 000 years ago. And certainly, the situation has changed. But not humans. With these “natural” original structure, there is no other better way to make a group of humans to work as a team, taking the best of each individual to put it to the service of the survival of the group and the species. It is the result of a basic logic used in the design of the systems we can be, quite limited physically. There has always been better that some (a few and the best naturally prepared for that task) to decide what is the best for the group, and the rest to do what is required, without questioning. It is (grossly) the same basis of the herds, packs and flocks we see in nature. Humans are not different from them when it comes to survival. It is the logical way. We are social creatures because is the way to survive. Intelligence does not make a difference on this matter. Our modern society uses this vertical structure we see in nature in many common organizations as the military, the state and the companies, among many. Our current problem with all of them is their nature, their purpose, and of course, their leaders. Rationality and evidence clearly say that all these components of our society are wrong. Besides they only are justified in a system that exists to serve itself, modern society. None of all these systems are sustainable, just as the root of them is, our modern society. Neither of them are good examples to follow. As there is no physical evolution, these types of humans are still very present today among our society. It is part of our nature. As it was at the beginning, as it will always be. Something to be accepted as part of our nature. The High Level leaders have the natural capacity to see everything in a very broad way. Their decisions are always based on what is the best for the species. They always see things, and decide, with the survival of the species (beyond the group) as the main goal. This way of seeing things, thinking and deciding comes naturally. It is part of their nature. They are less than 1% of the total population. Second level leaders (or high level followers) are about 4%, and the normal followers the rest (95%). The followers are the majority, and their natural way of thinking and seeing life and the world (reality), is limited to their very close reality. They are designed to see only their nearest square meter. They live for themselves and the needs of their family only. On the other hand they feel comfortable following orders, and doing what they are told. They do not question what they are told to do. They just do it. They follow procedures. They follow the rules, but do not make them, and if they do, they make very limited and faulty rules because of their limited view. They do not do some things just because are going to be punished, not because it is something wrong because it will affect others. Themselves and their family is all what matters to them. They cannot see beyond the borders of their properties, and the limits of their belongings. They have a limited capacity to question, only being attracted by what is related with them in the daily life (the here and now). They are designed to have a limited way of seeing their surroundings. They do not see more than what they need to solve the problem of the day. But that is the way it has to be for a human society to properly work. It is very important to note that followers are good on what they normally do, they are really good in solving small scale problems. In solving the details. The small scale but precise thinking. They are as intelligent as all the other humans. And could be really very smart. But outside of their specific area of knowledge, they have a very limited understanding. The followers in general are users of what others make or create, but are not curious about how they work. They are “gadgets users”. Their big limitation is a limited capacity for sapience, the broad band understanding, besides a very limited curiosity. But they are perfect for their role. Second level leaders have a broader way of seeing things than followers, and have a more ample way of seeing things, a bit beyond themselves, as they are open to decide for small groups. They can take responsibility for small groups, and they can do a good job on that. But not for the big group. They will fail in leading the big group. They also follow orders, but among those orders, there is usually more freedom to decide, and take responsibility, which they are open to take. Something followers will not do. High Level Leaders are naturally open to take full responsibility for the big group, followers and second level leaders won´t. They will always have the necessary view to find the best solution to a certain given problem involving the big group. These leaders will never take advantage of their position, followers would do it if they can, as they always think in their own benefit, and the benefit of their families. High level leaders have a very special characteristic that avoids conflicts among them, they are fully rational, and are capable of understanding that somebody else is better Leader than them, if the case. Or they can agree with other leaders in solutions that are a benefit for the species. The human species is the matter that counts. Intermediate level leaders will take some advantage of their position if they are allowed to, and take advantage of the position of their group, above others, if possible. They will never think in the society, in the species. At most they will see their own group. High Level Leaders have a very special ethics, as themselves are always in second place after the needs of the group. They are fully open to make sacrifices in their lifestyle for the benefit the group, even getting nothing in return. They will even accept to sacrifice their families or themselves if that is for the greater good. Leaders worry for the group, followers do not even see the rest of the group. Leaders and followers have the same intelligence, the levels of sapience each can achieve is what makes the big and notorious difference. It is important to note that the humans of the High Level leaders type, the ones that are born to be these type of leaders, genetically made for that purpose, are not the leaders we have today. They would never have a chance in a democratic society. Second level Leaders may have a chance, and probably some of the formal leaders we have today belong to this group. But many leaders of today are just followers. And along history, probably most of the big leaders have been of the second level type. The clue for a good human society is to have the proper leaders, because other than that, we have all we need. But, that is what we do not have today. And probably we have never had. On the other hand, if all humans would be of the leader type, they would never agree on anything, all would have a their “own” way. That is why leaders have to be a few, and the rest, have to be followers. High Level Leaders are genetically made to be wise and sapient. One of our big problems as modern society is that we try to make leaders out of followers, as by statistics 95 out of a 100 candidates will be a follower. Even second level leaders are not up to the requirements we have as society today. If they were acceptable in the past, today to the scale of problems we are dealing with, they are not sapient enough. The High Level leaders cannot be made or prepared, it is not a matter of a degree, family or studies. It is not also a matter of making nice promises. They try to solve the problems of the group always thinking in what is the best for the group and the survival of the species. They would never make a populist offer. They are not prepared to play the political role of the modern society, where the idea is to offer what makes followers happy, not what is the best for the society. Interestingly, followers show the same pattern of behavior within their families. But they cannot see the same restrictions when it comes to see the society as a whole. If we give to followers the power to decide, by popular election, they will decide with a very short term sight, thinking in their own immediate personal and familiar benefit. Conclusion, leaving to the followers the paramount decisions about our society will take us just to a disaster. As it is happening. The only way to do the right things is to accept that only High Level leaders can take society to a better place, and them cannot be elected, they just are, somewhere, hidden among the crowd, and society has to find them, and give them the necessary authority. Modern society in some way has to go back to what it was many hundred years ago, creating from that point a new an evolved structure of the pyramidal society of the past, now where High Level leaders decide what is the best. An evolved society where there is no status based on external things, where status is not important, where everybody has a place, without being less or more than others, a society where all are equal, but at the same time, different and unique. A society where everybody has something to give, and that giving does not make somebody more important than others. A society where having things is not the purpose. A society where power is not the goal. The evolved human society. Built around our purpose, true nature and true functionality. There is a lot to say and do regarding this matter. High Level leaders can be recognized by the way they think, talk, and by what they say and do, although they will be reluctant to be recognized as such, and try to have an ultra-low profile. This last situation is understood because in modern society, their ideas will always go against the trend, as the current general trend is clearly wrong. Even what they have as belongings will no be notorious, as they will never be worried of the social image. No fancy things. They do not need that. They practice simple life. They know what is really important. These guys are really objective and rational, cold in many ways when it comes to decide what is the best to do, and what is important. But other than that, they are humans like most. I know this theory is difficult to accept, as it will put a tag on each human. And that will collide with our ego in a society mostly built around ego. But as long as we accept that we all are as important in a crisis, no matter what group we belong to, and that none of them is more important given an extreme situation, and that either group is not more intelligent than the other. There should be no conflict in the long term. We do not need the High Level leaders yet, it seem we are OK today, and as society we are not prepared for them, but after the collapse, they will certainly be a need. Certainly, I do not want to convince others about my ideas, I just want to invite to see and think society in a rather different way, as it seems to me that this model explains better than any other one, the way humans behave in society (now and in the past), why we have so many problems today, and why there are no solutions ahead. Worse, ahead we only have more problems. And for sure democracy will not solve them, it will just make them worse. Of course, this is just a theory, and this is the simplified version. But I can see it puts a lot of sense, where today there is almost nothing (or just a bunch of disconnected ideas). One last thing to say, I am an atheist. I wouldn't blame democracy. The weaknesses of democracy have been known since at least Polybius - and regardless of how satisfying it is to believe that most of "those people" are stupid - they are just like us and everyone else. Government will never be nice because our rulers will never be better than we ourselves - and no matter what kind of education constitutes "intelligent, knowledgeable and informed" people will not behave like angels. Thanks all for comments. I won't be able to respond individually due to severe time constraints. I am preparing some comments on the interpretation of the Charlottesville, debacle. I see it in the context of a much bigger, global perspective. "diminishing capacity to do work and produce (what they think of as) wealth; a physical fact of reality"
That graph shows a big jump in per capita energy consumption worldwide, from 2000 to 2012. That jump is much larger than could be explained by a decline in EROI during that 12-year period. In fact, that increase would outweigh a decline in EROI from 100 down to 7 during that period. As a result, it appears that net energy per capita has increased considerably, and remains higher than it was in the early 2000's. Why do you say that we have diminishing capacity to do work and produce? Do you mean since 2013? "A democracy works only if the electorate are 1) intelligent, 2) knowledgeable, and 3) informed"
Is this any worse than it ever was? I read Brian Caplan's book, The Myth of the Rational Voter, about 10 years ago. His thesis is that voters correctly infer that it does not benefit them to spend time becoming informed about issues, because their own vote is so unlikely to affect the outcome of an election. If so, this factor has probably been at work since the beginning of democracy. Intelligence definitely hasn't decreased over the last 100 years. Quite the opposite, the IQ of the world population as a whole has shown a gradual but steady upward trajectory since 1930 (referred to as the "Flynn Effect": https://en.wikipedia.org/wiki/Flynn_effect). Perhaps voters are still badly misinformed, but they probably were just as misinformed 30 years ago, or perhaps even slightly more so because of the Flynn effect. I'll have to ask Gail about that graph. The units of energy are kilograms which makes no sense. I saw Gail at the last biophysical econ meeting in Montana and we talked about society's diminishing ability to do work. She looks at it from a financial-debt production perspective, but the long and short is that the lagging global economy is evidence that less real wealth is not being produced at rates previously had. 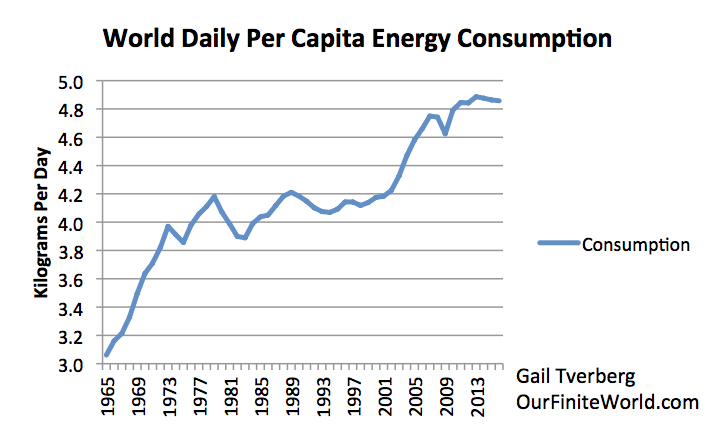 There are several things to think about in considering energy per capita. First is that you are actually measuring the 'free' energy or that which is available to do useful work. Total energy production as conventionally reported by those agencies you mention, is in things like raw barrels of oil or energy content of a raw barrel of oil. The net energy available to do real wealth-producing work is quite different, and growing substantially less with diminishing EROI. Another issue is the simple fact of using monetary units in the analysis. This also got some press at the BPE meeting. Data for things like energy intensity, for example, are extremely suspect due to the government's penchant for jiggering GDP, inflation, and other relevant calculations. No one can agree on a $ equivalent to free energy measures, say in joules. Our cost accounting systems use monetary units to measure stuff with, not free energy units. That is what makes the analysis so hard. My model uses only energy measures (work actually). Finally there has been an increasing general malaise in the global economy (in spite of the so-called Chinese miracle, which looks now to be running dry). Growth in real GDP and productivity have not been keeping up with growth in population since the mid 1970s. Read Gordon's "The Rise and Fall of American Growth". He attributes the increasing malaise to the idea that new technologies have not provided the kinds of boosts to productivity that the invention of the radio, trains, airplanes, etc. provided to the early 20th century. I somewhat agree that technology (its kind) is an important element, but it can't explain the whole malaise as well as a decline in net free energy per capita can. That's my $0.02 on that. RE: the Flynn effect you should read what Flynn himself has to say about the epiphenomenon. "What Is Intelligence? : Beyond the Flynn Effect", Mar 23, 2009 by James R. Flynn. IQ has always been controversial as a measure of something we call intelligence. There are now studies showing that people are loosing critical thinking capacity because of modern electronic technology (from calculators to TV to iPhones and GPS). In biological systems you use it or you lose it. And by the Baldwin Effect (https://en.wikipedia.org/wiki/Baldwin_effect) the possibility of future humans being even less intelligent because they are supported by advanced technology is a real possibility. You are correct that 30 years ago voters were just as uninformed and just as stupid. Not because of the so-called Flynn effect but because they have never been adequately sapient to become educated. Education isn't something school does to you, it is something you do to yourself, through work! What has changed is that the modern voter can feel informed because they read something in Facebook! I don't know about 'ever.' I think there have been rare moments in history when a handful of 'citizens' discussed issues intelligently, using reasoning faculties that our current population seems incapable of mustering.